Before :- H. Baryah, J.
W.P. No. 99 of 2006. D/d. 10.12.2009. For the Petitioner :- P.C. Prusty, Advocate. For the Respondents :- N. Sailo, Addl. Advocate. General. A. Police Act, 1861, Section 7 - Assam Police Manual, Rule 66 - Constitution of India, Article 311 - Departmental enquiry against Asst. Sub-Inspector of Police on the charge of shooting with revolver at his colleague - It was obligatory on the part of Inquiry Officer to ask the delinquent as to whether he wants to examine any defence witness in his favour - No such opportunity was offered to the delinquent - Plea that he was asked to produce witness during preliminary inquiry would not satisfy the said procedural defect and for an impartial enquiry - Enquiry held to be vitiated. B. Police Act, 1861, Section 7 - Assam Police Manual, Rule 66 - Constitution of India, Articles 311 and 309 - Central Civil Services (Classification, Control and Appeal) Rules 1965, Rule 15 - Removal from service - Whether removal can be given effect retrospectively - Delinquent, was removed from service on account of shooting at his colleague, not on account of his desertion or conviction in a Court of law - Charge and proof of the same would fall within purview of Instructions No. 4 under Rule 15 of CCS Rules - Therefore, such removal could be made effective only from the date of issuance of the order and not from an earlier date. Dr. Rajyamalla Buzarbarua v. Assam Administrative Tribunal and Ors., 1983 Lab IC 1839. Baharul Islam (CT) v. Union of India and others, 2001 (1) GLT 62. Dr. 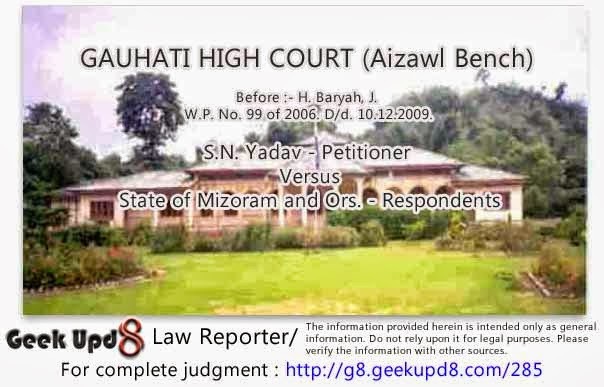 Rash Lal Yadav v. State of Bihar, 1994 AIR SCW 3329. G. M. Tank v. State of Gujarat and others,(2006) 5 SCC 446 : AIR 2006 SC 2129. Nelson Motis v. Union of India, AIR 1992 SC 1981 : 1992 Lab IC 2037. Privy Council, Nazir Ahmed v. Emperor, AIR 1936 PC 253 (2). Senior Supdt. of Post Offices v. A. Gopalan, AIR 1999 SC 1514 : 1999 Lab IC 234. State of Gujarat v. Shantilal Mangaldas and Others, AIR 1969 SC 634. State of Rajasthan v. B. K. Meena and others, (1996) 6 SCC 417 : AIR 1997 SC 13 : 1996 Lab IC 2750. H. Baryah, J. - In this writ petition the dismissal orders dated 16-3-2006 passed by the Superintendent of Police. Aizawl and the appellate order dated 26-9-2006 passed by the Appellate Authority are impugned. Order dated 16-3-2006 in particular was alleged to have been made without adhering to the established procedure of conducting of departmental inquiry. The writ petitioner in view of the facts and the grounds contended in the petition asks for quashing the aforesaid orders and to reinstate him in the service with all benefits. "the respondents shall now proceed with the enquiry de-novo from the stage of the furnishing of the copy of the enquiry report enabling the appellant to make a representation against the same. If such representation is made by the appellant, the Disciplinary Authority shall deal the same in accordance with law and consistently with the observations made above. In the event of the appellant being aggrieved by the orders to be passed by the Disciplinary Authority, it will open for him to make statutory appeal to the departmental Appellate Authority. With this direction the judgment and order dated 8-12-2003 passed in W. P. (C) No. 19 of 2002 stood interfered with and allowed partially. 3. From the reading of the judgment of the Division Bench it would be apposite that on account of non-supply of the Enquiry Report to the writ petitioner herein, the Division Bench while dealing with the Writ Appeal No. 1 of 2004 directed a de-novo inquiry from the stage of furnishing the copy of inquiry report enabling the writ petitioner to make a representation against the same. It would also be apposite to mention at this stage that the Division Bench of this Court also set aside the impugned order dated 6-10-1995 and the appellate order dated 6-9-2001 which goes to show that the removal order dated 6-10-1995 became non-existent. 4. Per direction of this Division Bench vide judgment and order dated 27-1-2006 passed in Writ Appeal No. 1 of 2004, the petitioner was supplied with a copy of the inquiry report against which the petitioner submitted a detailed representation on 27-2-2006 challenging therein the findings of the Inquiry Officer on various grounds and prayed for exoneration. However, Disciplinary Authority without paying any attention to the representation as indicated above removed the petitioner from service by order dated 16-3-2006 giving retrospective effect from 5-10-1995. Against the order of removal dated 16-3-2006 petitioner submitted a statutory appeal before the respondent No. 3 on 3-4-2006. However, the Appellate Authority rejected the aforesaid appeal and confirmed the punishment of removal order dated 16-3-2006 passed by respondent No. 4. It is contended that the appellate order was passed by the authority mechanically and without due application of its mind which, therefore, cannot sustain in law. The writ petitioner, therefore, being aggrieved by the order of removal dated 16-3-2006 and the appellate order dated 26-9-2006 approached this Court with this instant petition under Article 226 of the Constitution. 5. It is also contended that during the conduct of the inquiry, the petitioner was refused to have the assistance of a defence assistant. Since he was ignorant and inexperience in the matter relating to departmental inquiries and the intricacies and technicalities involved therein the petitioner asked for assistance of a defence assistant. Further no Presenting Officer was appointed, rather, the Inquiry Officer himself conducted the departmental proceeding which is violative of Article 311(2) of the Constitution of India. It is further contended in the writ petition that the procedural requirements had not been followed while conducting the departmental inquiry. It is also contended that the removal order impugned in this writ petition which has a retrospective effect from 5-10-1995 cannot sustain legally in view of the Government of India's instruction appended in Rule 15 of CCS (CCA) Rules, 1965 which speaks for strict prohibition of giving retrospective effect. The writ petitioner in view of the facts and circumstances of the case and grounds has asked for setting aside of the removal order dated 16-3-2006 and the appellate order dated 26-3-2006 with a prayer to reinstate the petitioner in service with back wages and all other consequential benefits. "15. That with regard to the statements made in paragraph No. 21 of the writ petition, I say that the Disciplinary Authority or the Enquiry Officer is not bound to appoint a defence assistant to aid the charged officer. It is upto the charged officer and the discretion of the Enquiry Officer to appoint such defence assistant as found fit and reasonable. The petitioner was informed to engage a defence assistant if desired Vide No. DY.SP(Hqrs. )/DE/SNY/95/8 dated 1-6-1995. However, the petitioner failed to engage the same and therefore, there is no question of refusal on the part of the respondents to provide defence assistant to the petitioner. 16. That with regard to the statements made in paragraph No. 22 of the writ petition, I say that during the preliminary hearing held on 7-6-1995, the charged officer was asked whether he had any documents to be inspected of any witnesses to produce in his defence and to which, he had none. Therefore, it was not necessary to ask the petitioner after completion of the Departmental enquiry whether he wished to produce a defence witness or not. He could have mentioned the names of defence witnesses if any at the time of hearing. That the witnesses in the instant case are capable and reliable police officers who are well aware of their sense of responsibility and there is no question of the Enquiry Officer dominating and influencing them." In regard to the statement made in paragraph-28 of the writ petition it is contended by the respondents that the order of removal of the petitioner from service is not retrospective rather the order was dispatched vide No. E/RO/PF-SN/95/1832 dated 6-10-1995. 7. Mr. P. C. Prusty, learned counsel for the writ petitioner as well as Mr. N. Sailo, learned Addl. Advocate General for the respondents were heard at length. 8. Mr. Prusty at the very outset of his argument submitted that the petitioner had to shoot at ASI, Robert L. Hnamte in his right of private defence of person when said Robert L. Hnamte tried to assault him during the course of altercation. On account of shooting, a charge sheet being laid against the petitioner, he (petitioner) faced the trial. But the trial Court was pleased to acquit him from charge. The order of removal dated 6-10-1995 was made prior to the conclusion of criminal trial. The impugned removal order dated 16-3-2006 was however, passed by the Disciplinary Authority after closure of the criminal proceeding which resulted in acquittal. Therefore, it would have been appropriate on the part of the Disciplinary Authority and the Appellate Authority as well to record a favourable finding in view of acquittal of the petitioner from the charge by the trial Court. It was further argued by him that in both the proceedings, the facts are identical and the same set of witnesses is cited for the purpose of arriving at a decision. According to Mr. Prusty in this circumstance on account of acquittal of the writ petitioner from the charges the second removal order dated 16-3-2006 ought not to have made by the Disciplinary Authority and therefore, the finding recorded in departmental proceeding is unjust, unfair and oppressive. The removal order, therefore, is not sustainable and liable to be set aside and quashed. Reliance was put in this context by Mr. Prusty in the judgment rendered by the Supreme Court in the case between G. M. Tank v. State of Gujarat and others; reported in (2006) 5 SCC 446 : (AIR 2006 SC 2129). Mr. Prusty put emphasis in the paragraphs 20, 30 and 32 of the judgment. In the case (supra) Apex Court set aside the order of dismissal as not sustainable on the ground of acquittal of the appellant honourably in the criminal proceeding on account of having same set of facts, evidence and witnesses in both the departmental inquiry and criminal proceedings. Criminal proceeding ended in acquittal for want of evidence. 5. So far the first point is concerned, namely, whether the disciplinary proceedings could have been continued in the face of the acquittal of the appellant in the criminal case, the plea has no substance whatsoever and does not merit a detailed consideration. The nature and scope of a criminal case are very different from those of a departmental disciplinary proceeding and an order of acquittal, therefore, cannot conclude the departmental proceeding. Besides, the Tribunal has pointed out that the acts which led to the initiation of the departmental disciplinary proceeding were not exactly the same which were the subject-matter of the criminal case. (Emphasis supplied). 10. Similarly in Senior Supdt. of Post Offices v. A. Gopalan (AIR 1999 SC 1514 : 1999 Lab IC 234), the view expressed in Nelson Motis v. Union of India was fully endorsed by this Court and similarly it was held that the nature and scope of proof in a criminal case is very different from that of a departmental disciplinary proceeding and the order of acquittal in the former cannot conclude the departmental proceedings. This Court has further held that in a criminal case charge has to be proved by proof beyond reasonable doubt while in departmental proceeding the standard of proof for proving the charge is mere preponderance of probabilities. Such being the position of law now settled by various decisions of this Court, two of which have already been referred to earlier, we need not deal in detail with the question whether acquittal in a criminal case will lead to holding that the departmental proceedings should also be discontinued. That being the position, an order of removal from service emanating from a departmental proceeding can very well be passed even after acquittal of the delinquent employee in a criminal case. In any case, the learned single Judge as well as the Division Bench did not base their decisions relying on the proposition that after acquittal in the criminal case, departmental proceedings could not be continued and the order of removal could not be passed." Mr. Sailo further in support of his contention also relied in the ratio laid in the case between State of Rajasthan v. B. K. Meena and others; reported in (1996) 6 SCC 417 : (AIR 1997 SC 13 : 1996 Lab IC 2750), wherein the Apex Court laid a distinction between the approach and the objectives in departmental inquiry and criminal trial. "it appears that the Enquiry Officer himself questioned the delinquent officer before he inspected the documents he wanted to inspect. .... .... .... .... .... The right to call and examine witness, is therefore, as a general rule, of the procedure required by natural justice. .... .... .... .... It is well settled that the requirements of natural justice cannot be put in a strait-jacket. .... .... .... ...., the refusal to grant this request would amount to denial of reasonable request to defend himself and the essential principles of natural justice would he violated." Keeping in view the above decision, it is a settled law that the minimum opportunity should be given to the petitioner to defend himself which is not done in the instant case, as appeared from the enquiry report, which was produced along with report by the respondents. It is therefore crystal clear that enquiry proceeding was conducted against the petitioner is against the fundamental principles of natural justice and it is violative of the principle of natural justice and consequent thereto the order dated 25-4-95 passed by the respondent No. 2 affirming the disciplinary proceeding is not maintainable as it based on wrong proceeding conducted by the Enquiry Officer. In view of the above discussion, and considering the facts and circumstances of the case, I am of the opinion that, the enquiry report against the petitioner is liable to be set aside and quashed so also the impugned order of penalty dated 20-2-95 passed by the respondent No. 2 is liable to be set aside and quashed. Accordingly the enquiry report and the order dated 20-2-95 passed by the Disciplinary Authority and the order dated 25-4-95 passed by the respondent No. 2 are hereby set aside and quashed and the writ petition is allowed to the extent indicated. No costs." 11. Contrary to the argument advanced by Mr. Prusty in the context of refusal to take assistance of a defence assistant and non appointment of presenting officer, and examination of the witnesses by the Inquiry Officer himself, it was argued by Mr. N. Sailo, Learned Addl. Advocate General that in a disciplinary proceeding Disciplinary Authority or the inquiry authority is not bound to appoint a defence assistant to aid the charged officer. It is up to the charged officer and discretion of the Inquiry Officer to appoint such defence assistant it found fit and responsible. It was argued that the writ petitioner was informed to engage a defence assistant if desired vide No. DY.SP(Hqrs. )/DE/SNY/95/8 dated 1-6-1995 but the petitioner failed to engage a defence assistant of his choice and, therefore, no question of refusal on the part of Inquiry Officer to provide defence assistant to the petitioner. It was argued by Mr. N. Sailo that the claim of the writ petitioner is unfounded and baseless. This particular stand is projected in paragraph 15 of the counter. Therefore, there would be no violation of principle of natural justice as laid down in the case (supra). 12. In the context of refusal on the part of the Inquiry Officer to examine defence witnesses, it was argued by Mr. Prusty that after completion of examination of the prosecution witnesses, he was never asked by the Inquiry Officer as to whether he wishes to examine any defence witness in his defence. Therefore, the Inquiry Officer failed in his duty and to comply with the procedural requirements as required therefor. It was also argued that during the course of inquiry the petitioner wished to examine some of the independent witnesses and accordingly made a request to allow him to do so. But the Inquiry Officer resorted no action in securing attendance of those witnesses named by the writ petitioner. Of the cited witnesses only 4(four) were examined by the Inquiry Officer, such examination of the witnesses infers the picking of some of the witnesses of his choice. These facts, according to Mr. Prusty, the learned counsel for the petitioner entail very much the ratio laid down in the case (supra), reported in 2001 (1) GLT 621. 13. Per contra of this submission it was argued by Mr. N. Sailo, learned Addl. Advocate General that during the preliminary inquiry held on 7-6-1995 the petitioner was asked whether he had any documents to be inspected or any witness to produce in his defence to which he negated, therefore, it was not necessary on the part of the Inquiry Officer to ask him to produce any defence witness after completion of the examination of the prosecution witnesses. It was also argued by Mr. N. Sailo that during the course of hearing of departmental inquiry, the writ petitioner did never mention the names of his defence witnesses, therefore, the claim of the writ petitioner that he was not asked to adduce defence evidence is not acceptable. Such argument of Mr. Sailo cannot inspire confidence of the Court since it was obligatory rather a duty on the part of Inquiry Officer to ask the delinquent officer whether he wishes to adduce any defence witness in his defence. The contention that he was asked to produce witness during the preliminary inquiry would never satisfy the procedural defect as noticed from the averments of the writ petition. I find no force in the facts situation in the argument of Mr. N. Sailo, learned Addl. Advocate General for the State respondents. It was contended by Mr. P. C. Prusty that the finding of the Disciplinary Authority thus turns perversed and the same cannot stand. Every departmental enquiry is guided by some procedure. If such procedure is not adhered to while conducting the enquiry, finding on the basis of such enquiry would be perversed and judicial interference would call for. For an impartial enquiry the right accrued to the delinquent is to be honoured and every opportunity is to be afforded to him/her. "25. A century ago, in Taylor v. Taylor, Jassel, M. R. adopted the rule that where a power is given to do a certain thing in a certain way, the thing must be done in that way or not at all and that other methods of performance are necessarily forbidden. This rule has stood the test of time. It was applied by the Privy Council, Nazir Ahmed v. Emperor (AIR 1936 PC 253 (2)) and later by this Court in several cases, to a magistrate making a record under Sections 164 and 364 of the Code of Criminal Procedure, 1898. This rule squarely applies "where, indeed, the whole aim and object of the Legislature would be plainly defeated if the command to do the thing in a particular manner did not imply a prohibition to do it in any other. The rule will be attracted with full force in the present case, because non-verification of the surrender in the requisite manner would frustrate the very purpose of this provision. Intention of the Legislature to prohibit the verification of the surrender in a manner other than the one prescribed, is implied in these provisions. Failure to comply with these mandatory provisions, therefore, had vitiated the surrender and rendered it non est for the purpose of Section 5(3)(b)." 15. In view of the law laid down by the Apex Court and the Government of India's Instruction No. 4 under Rule 15 of CCS (CCA) Rules, 1965 it was argued by Mr. P. C. Prusty, learned counsel for the petitioner that order of removal dated 16-3-2006 cannot sustain in law and it is liable to be set aside and quashed on this score alone. 16. Respondents in reply to the statement made in paragraph-28 of the writ petition in the context of this issue raised by the writ petitioner contended nothing in paragraph-21. It is contended simply that the impugned order of removal of the petitioner from service is not retrospective. This naked contention rather objection raised by the respondents fails to goad the Court to take a different view than that of the view adopted by the Supreme Court in the Cases (supra) and the instruction of the Government of India as indicated above under Rule 15 of CCS (CCA) Rules, 1965. 17. Taking care of the facts and circumstances of the case and the law laid down by the Supreme Court and this Court and the provisions of CCS (CCA) Rules, impugned order dated 16-3-2006 as well as the appellate order dated 26-9-2006 cannot stand in the eye of law. Both the orders are accordingly set aside and quashed. The respondents, respondent No. 4 in particular is directed to reinstate the petitioner in his post earlier held by him with all benefits. Such reinstatement should be made from the date of his suspension. However, the respondent authorities would not be precluded from initiating a de novo departmental inquiry against the writ petitioner, if so advised. 18. With the above direction, this writ petition is allowed. No cost.